Panasonic has unveiled the latest editions to its lineup of Lumix digital cameras, headlined by the Lumix LX5, an update to its earlier LX3 with beefed up image processing and lens to improve picture quality and boost its low-light performance. Additional offerings until 14-megapixel super-zoom cameras capable of 1080p video capture and high-frame-rate shooting, a consumer-friendly point-and-shoot camera with 1080p video capability, and an affordable water- and shock-proof point-and-shoot camera. Starting out, the Lumix LX5 is intended to put pro-quality photography in the hands of everyday camera users, without all the confusion of DSLRs. Building on Panasonic’s earlier LX3, the LX5 has an ultra wide-angle 24mm lens with a 3.8× optical zoom and a new Venus Engine FHD processor that work together to improve image quality: the camera also sports a 10.1 megapixel resolution, a 3-inch LCD, a 400-shot battery life, and a hot shot for accessories like an external flash. Expect to see it in later August for a suggested price of $499.95. Next up, the Lumix FZ100 and FZ40 superzoom cameras, sporting a 24× optical zoom and 14.1 megapixel resolutions. The FZ100 is Panasonic’s first hybrid compact camera with a MOS sensor, and it can capture 1080p video as well as do burst shooting at 11 frames per second with a mechanical shutter, making it great for action shots—and the continuous autofocus can handle up to five frames per second. The FZ40 features updated manual and creative imaging controls, including the ability toi quickly change aperture and shutter speed, along with a wide range of creative options, including high dynamic range photography. Both FZ models feature 3-inch LCD displays; the FZ40 should land in August for $399.95; the FZ100 will run $499.95. Next up, the Lumix FX700 is a less-specialized—and less expensive—offering designed to appeal to everyday consumers, with a 14.1 megapixel rsolution, 1080p video recording, a 3-inch LCD display, and a 5× optical zoom. The FX100 uses touchscreen controls, enabling things like setting the autofocus by touching the subject in the LCD screen; from there, the AF tracking function and Intelligent Scene Selector can do most of the work. Expect to see the Lumix FX100 in late August for a suggested price of $399.95. Finally, for folks who are more concerned with living a rugged lifestyle than snappy artsy photos, Panasonic is offering the Lumix TS10, a 14.1 megapixel point-and-shoot camera that can shoot 720p video and just happens to be waterproof to a depth of about 10 feet, shockproof to about 5 feet, dustproof, and capable of handling temperatures down to about 14°F. And to prevent scratches, Panasonic is even throwing in a silicone jacket for the camera. The TS10 features a 2.7-inch LCD display, features intelligent ISO control for good exposures, along with face detection, quick autofocus, and optical image stabilization to prevent blur. 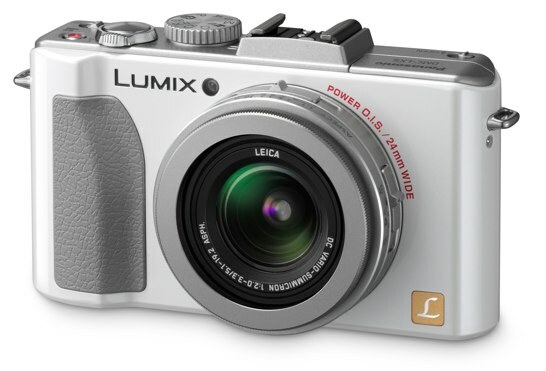 Expect to see the Lumix TS10 in September for a suggested price of $249.95.